Why Should You See a Chiropractor After Auto Injury? Auto accidents are inevitable and according to the latest statistics reported by Tennessee Department of Safety and Homeland Security, approximately 500 auto crashes are reported each day in the state of Tennessee alone. 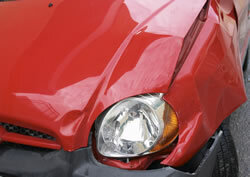 This corresponds to 150,000 automobile accidents per year and an even higher rate of auto injuries. Although, seeing a primary care physician is mandatory after any auto accident (to diagnosis and manage visible injuries), it is highly recommended to see a chiropractor as well. Pain is a protective mechanism that indicates an underlying injury or trauma to the tissue. In other cases, a misalignment of tissues, ongoing process of inflammation or sprain/ tearing of supporting connective tissue may also present as moderate to severe pain. Pain-killers only mask the symptoms or sensation of pain (without offering much help in the management of root cause). Nashville chiropractor, Dr. Jim Sweeney can help you with pain management as you recover from your auto injury. Auto injuries limit mobility and physical independence due to pain (that may be due to mild bruising or in some cases due to fracture, dislocation, inflammation or disc prolapse/ herniation). A delay in the identification of actual cause of pain can increase the risk of inflammation (leading to arthritis, tendonitis), disc degeneration, muscle atrophy and other complications. Consequently, this not only delays the pace of healing but also leads to stiffness, limited range of motion, limping and other related issues with mobility. Dr. Jim Sweeney, Nashville chiropractor utilizes specialized techniques and methods like chiropractic manipulation and adjustment, flexibility training, spinal and postural screening, sensory and motor balance training and corrective exercises and devices. Often times, the extent of joint/ tissue damage is more severe (and totally in disconnect with the force of impact). The primary cause is weak architecture and poor nutritional status. Besides managing auto injuries, Nashville chiropractor, Dr. Jim Sweeney also provides nutritional counseling and support to strengthen and stabilize spinal architecture in order to prevent age related or traumatic damage in future. Needless to say that moderate to severe auto injury is always associated with mental, emotional or psychological trauma that may result in depression, anxiety or phobias. The effects are usually long lasting and require a more integrative approach for management. Nashville chiropractor, Dr. Jim Sweeney provides lifestyle advice, community and workplace workshops, goal-oriented care for early return to a normal, healthy and functional life after auto injury. Call Sweeney Chiropractic for relief from auto injuries today!